It’s widely accepted that the Pontiac GTO was the first true “muscle car” made by Detroit. Working to keep ahead of the competition, the 1966 GTO set a sales record with 96,946 cars sold. It combined great looks with unmatched performance, and you can make your own miniature version with 1966 Pontiac GTO Model Kit! This fun kit features parts and pieces needed to create a ’66 GTO with a detailed 389 V8 engine with tri-power carbs, tampo printed red lines, and two sets of wheels choices. Soft black tires and chrome-plated parts finish the model, helping its white, clear, and transparent red color pop. 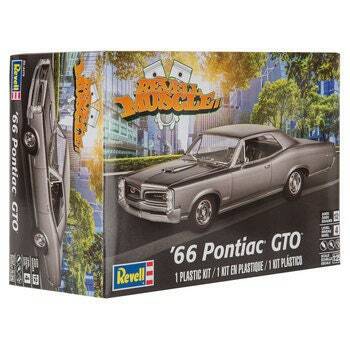 Gather your favorite paints (not included), and design the exterior to make the GTO your own!